Nutmeg is known by many names, such Myristica fragrans, mace, magic, muscdier, muskatbaum, myristica, noz moscada, nuez moscada, and nux moschata. 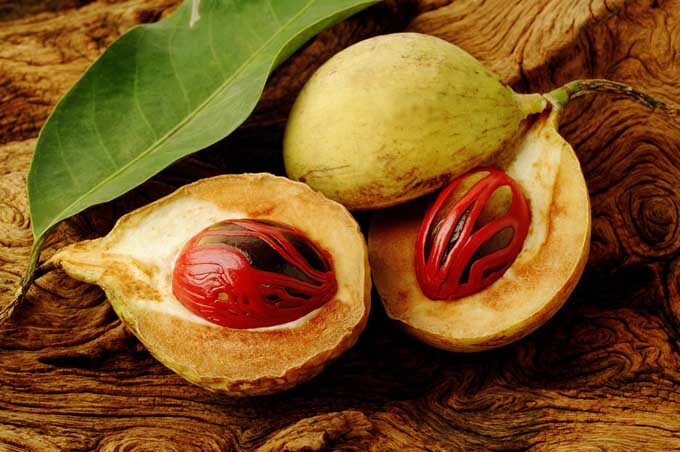 Nutmeg is most commonly used as a cooking spice, comes from the fruit of a 50 ft (15 m) tall tropical evergreen tree. This tree grows in Indonesia, New Guinea, and the West Indies. The bark is smooth and grayish brown with green young branches and leaves. The oblong, fleshy fruit, called the nutmeg apple, contains a nut from which nutmeg is made. The dried nut and essential oil are both used as medicine. Nutmeg is used in both Western and Chinese herbal medicine. It is most popular as a spice in food and drinks, and is also used in cosmetics and soaps. 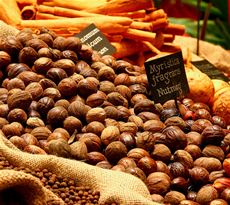 In ancient Greece and Rome, where nutmeg was rare and expensive, people thought it stimulated the brain. The Arabs have used nutmeg since the seventh century. 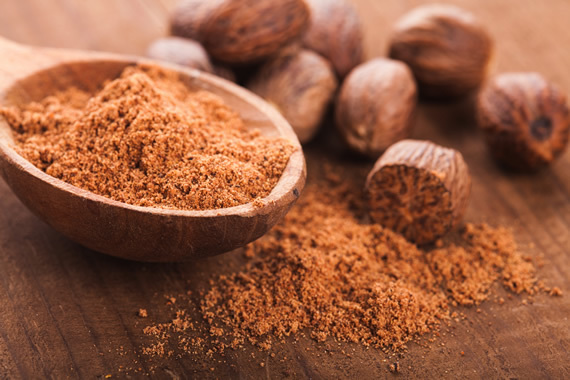 Nutmeg relaxes the muscles, sedates the body, and helps remove gas from the digestive track. It is most commonly used for stomach problems such as indigestion. It is also used for chronic nervous disorders, kidney disorders, and to prevent nausea and vomiting. In Chinese medicine, nutmeg is used to treat abdominal pain, diarrhea, inflammation, impotence, liver disease, and vomiting. In the Middle East, some cultures are said to use nutmeg in love potions as an aphrodisiac. The essential oil of nutmeg is used for rheumatic pain, toothaches, and bad breath. In Germany, it is used for problems related to the stomach and intestines, but this use is controversial. In homeopathy, nutmeg is used to treat anxiety or depression. Although nutmeg has been used to treat many ailments, it hasn’t been proven to be useful or effective for any and it can be harmful. 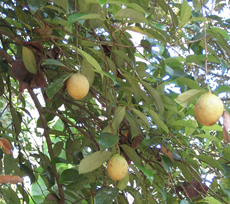 Nutmeg is used in medicines such as Vicks Vaporub, Agua del Carmen, Aluminum Free Indigestion, Incontinurina, Klosterfrau Magentoniuum, Melisana, and Nervospur. Nutmeg is made from the nut of the nutmeg apple. It is removed from the fruit and slowly dried. As an herbal medicine, nutmeg is commonly used in capsules (200 mg), powders, and essential oil. As a cooking spice, the nut is ground and cooked in food. The skin of the nuts is ground to produce another spice, called mace. Nutmeg butter, a mixture of fatty and essential oil, is made by chopping and steaming the nuts until they form a paste. Some of the suggested doses of nutmeg can be harmful. For nausea, other stomach problems, and chronic diarrhea, one or two capsules or nutmeg kernel as a single dose or three to five drops of essential oil on a lump of sugar or on a teaspoon of honey is suggested. For diarrhea, 4-6 tbsp of powder could be taken every day. For a toothache, one or two drops of essential oil can be applied to the gum around the toothache to relieve pain; a visit to the dentist care is still necessary. In Chinese medicine, 250–500 mg of nutmeg mixed with other herbs is recommended, once or twice a day. It can be taken in powder plain, capsules, pills, or infusion, and should be taken on an empty stomach. When used as a digestive stimulant in Chinese medicine, it is said to work best when ground and cooked in food. Nutmeg is not recommended for use as a medicine because it is too risky. An overdose of nutmeg is harmful and sometimes deadly. There are more effective treatments for all of the ailments that nutmeg could be used for. Pregnant women should not use nutmeg because it can cause a miscarriage. Women who are breast-feeding should not use nutmeg either. Nutmeg should be used with caution in patients with psychiatric illnesses, as it can cause feelings of anxiety. Touching the nuts can cause an allergic skin reaction. In the home, nutmeg should be kept out of the reach of children and pets. There are no known side effects from using nutmeg properly. Too much nutmeg, however, can cause serious health problems and even death. Early symptoms of an overdose of nutmeg (one to three nuts) are thirst, nausea, and feelings of urgency. There may also be experiences of altered consciousness; this can range from mild to intensive hallucinations, and results in a stupor that lasts from two to three days. Sometimes shock and seizures occur. Immediate medical attention is necessary when someone has taken too much nutmeg. Recent studies of the anxiogenic, or anxiety-causing, effects of nutmeg indicate that it counteracts such tranquilizers as diazepam (Valium), ondansetron (Zofran), and buspirone (BuSpar). The specific substance in nutmeg that is responsible for this effect is a compound called trimyristin. There are, however, no known medical conditions that contraindicate the use of nutmeg in small quantities.